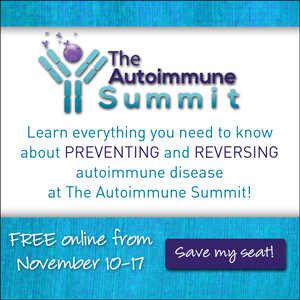 Uncategorized The Autoimmune Summit is almost here! I wanted to let you know about this free event next week; if you are listening to Autoimmune Adventures, you might find the Autoimmune Summit of interest too! Nearly 40 experts in the fields of Functional Medicine, nutrition, and autoimmune disease will explain how leaky gut, genetics, and environmental triggers such as toxins, food sensitivities, infections, and stress all play a part in the development of autoimmune disease. The summit is free online from November 10-17. That’s 40 experts in 7 days! Each day there will be speakers you can listen to for free. If you are unable to listen to all the presentations on some days, you can purchase the complete set of recordings to listen to whenever you like. Reserve your place by signing up here! If you would like to sign up to access the summit, register for free at this link. The organizers will email you each day letting you know which talks are scheduled, so that you can keep track. I am Interested in research and education as I am a Support Group Leader & Volunteer for AARDA. We are the first Autoimmune Support Group In the Nation and we are very proud to be with http://www.aarda.org as there are over 100 autoimmune related diseases and growing. So pleased that you and AARDA have started an autoimmune support group! Best of luck to you.